Happy Bump Day! There are only about seven weeks left until my actual due date. I am getting so excited and a little bit nervous. I think we have everything all ready, except I need to pack my hospital bag… There is so much to think about but in all reality everything will come together, especially now that we have all of the bigger items out of the way. I still need to buy a nosefrida though, that’s been on my list for months! There are really so, so many things that you have to think about before baby arrives, not to mention after! I am working through my birth plan this week and reading some newborn care books as well. This book helps you to feel empowered about child birth. I am trying to tell myself that it really is mind over matter and not to listen to the bad stories. It might hurt but I am trying to stay positive and excited and that is exactly what this book helps with along with a lot of other useful child bearing information. I highly recommend it! This book gives you information regarding attachment parenting, and everything you need to know about baby through to two years old. It’s a great resource! This book provides information on the importance of nutrition and diet and the impact it can have on baby from conception to birth and beyond. Super helpful and interesting. Although, pregnancy cravings like Reeses Pieces can get in the way sometimes! I have had a pretty easy pregnancy and while I am nursing a bit of a cold now, I can’t complain much, I’ve actually loved most of it. It is sad that it soon will be coming to an end but we are so excited to welcome this new little human into the world! Our nursery/boys room is now basically complete. We have a few finishing touches left but for the most part, it’s done! Hitting week 20 of pregnancy and I am feeling pretty good! Good nutrition is super important for pregnancy and I have researched and consulted with holistic nutritionists and my doctor about supplements during pregnancy. I knew for sure that I wanted to focus on whole food vitamins and I had already been taking the Mega Food Baby and Me vitamin for about eight months prior to becoming pregnant. It contains all of the vitamins and minerals necessary to help develop baby and sustain a healthy pregnancy, including Folate which is so important before and during early pregnancy. 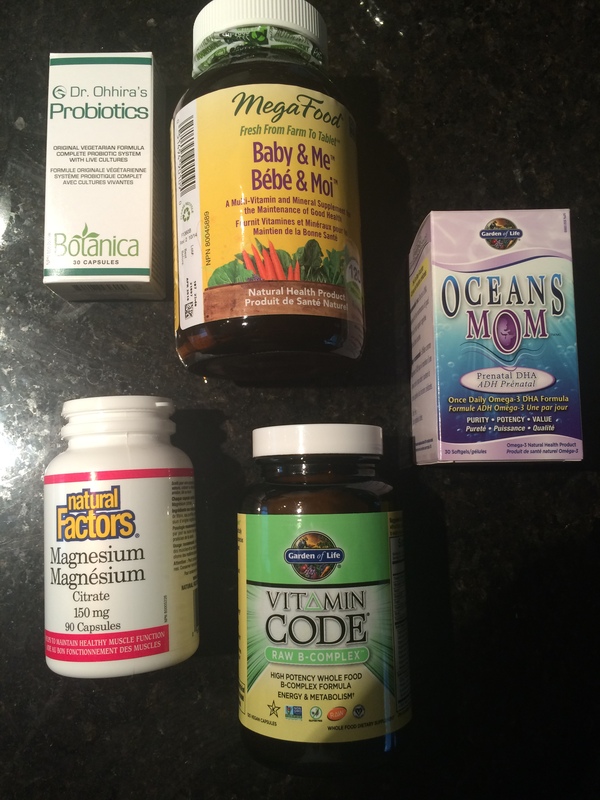 I read a lot about vitamins and a couple of lists that I found helpful were from Mama Naturaland Wellness Mama, sharing the supplements that they take during pregnancy. I don’t take all that they take and it really depends on your comfort level and needs during pregnancy. One thing that Enza Ward, Registered Holistic Nutritionist and owner of Senzable Healthpointed out to me that was super important for pregnancy was probiotics. Babies are born with a sterile gut so it is so important to take a high quality probiotic supplement or obtain probiotics through food to get the right balance of gut bacteria. I am taking Dr. Ohhira’s probiotics which contain 12 probiotic strains and use a traditional Asian fermentation process. You can also obtain probiotics through fermented foods such as kimchi and sauerkraut as well as tempeh and kefir. Another supplement that I feel is very important is a good prenatal omega three that contains DHA and EPA. I have been taking the Garden of Life brand Ocean’s Mom. Recently, I have been reading articles that say most of the population is deficient in magnesium. Magnesium is important for general health but can help to get things moving, especially in pregnancy. I am taking a magnesium citrate from Natural Factors. I usually take a B-complex vitamin to help regulate my mood and for energy. I was taking it leading up to pregnancy and have taken it periodically throughout. B vitamins are water soluble so you pee out any excess however, it is important not to over do it. I have also been drinking red raspberry leaf tea, periodically. It is said to help with morning sickness and strengthen the uterine muscles. There are many other supplements women can take in pregnancy and it is really up to the mother what her comfort level is and her needs in pregnancy. *Disclaimer: I am not a doctor, nutritionist, naturopath or medical professional. These statements are my own personal beliefs. Please consult with a doctor before taking any supplements. I had been debating about making a post about some exciting things that are happening in my life right now but, I think it is definitely something worth sharing! We are expecting a baby at the end of February and couldn’t be more thrilled. It is important to us to not share too much and to keep photos private, especially in this high-paced technological world. I thought that I would take this opportunity to share a little bit of what I have learned so far on this journey and trust me, I am no expert and every pregnancy is definitely very different. Some women don’t take a prenatal at all and focus on getting the right amount of nutrients through food though it can be difficult to eat sometimes depending upon your symptoms, especially in the early stages. To ensure I am getting enough nutrients, I found the Mega Food Baby and Me Prenatal was easy on my stomach and all of the vitamins and minerals were from whole foods, including the right amount of folate. So far so good. I have a great doctor and have faith in our medical system but am seeking out certain alternatives. If you don’t feel like you agree with what your doctor is saying, there are other experts that you can talk to. Naturopaths and midwives can offer different perspectives. You may have a gut feeling about something but your doctor can sometimes be a bit by the book and not interested in alternative measures or discussions, so seek out other resources too. I am also using the help of an awesome doula from Chinook City Doulas! So, I’ve had a few people say to me, “I know i’ll eat healthier when I am pregnant.” No, that’s not how it works. I have become so ravenous that while I still definitely consider healthy eating a top priority I am also focused on eating food in general and sometimes, cravings really get the better of you, like my french fry pickle craving. Try to develop healthy habits prior to pregnancy so that you are more accustomed to that way of eating. This one is super important to me. It’s harder to control what you encounter when you are out and about so, if using less toxic products is a priority try to eliminate them altogether while you are at home. We all have a body burden of toxins that our bodies can handle and I definitely don’t want these chemicals affecting my baby’s development. It’s hard to avoid them altogether but make simple swaps such as using non-antibacterial hand soap (antibacterial soap has not been proven more effective), make your make-up bag green, use vinegar, lemon and some safe for pregnancy essential oils in your home during pregnancy. My activity level has gone down significantly because I have been so tired but, when I do manage to make it to yoga class I’ve noticed it does help a lot. Also, doing simple stretches at home such as child’s pose, can really help ease back pain, or what I have found thus far. Sometimes it’s hard to keep things moving. I’ve found that taking magnesium citrate has really helped me in this department and also trying to keep up with probiotics to help generate good gut bacteria to help the developing baby is important to me. A lot of these things can apply in general and not just in pregnancy. There are so many other tips but really just relax and enjoy this time. Go with your gut, you know what’s up. Now, the second half of this post, gender guesses! UPDATE! The old wives tales were right, baby is a boy!! Basically you are having a girl if your beauty disappears during pregnancy. It is said that the girl steals the mother’s beauty. There are many more that you can do but these are just some of the one’s I’ve tried. We’ll see if they are right!